When Pope Benedict XVI travelled to Cuba two weeks ago, he was acting within a long tradition. Popes, after all, are not only spiritual leaders, they are representatives of the oldest continuous absolute monarchy in the world, which traces back to the Apostle Peter two millennia ago: The Holy See has been engaging in diplomacy far longer than any modern state has been in existence. On account of that history, and because of its spiritual authority, the Vatican has a rare sort of international clout, one that doesn’t depend on armies or a gross national product. Pope Benedict XVI cannot be accused of shirking his responsibility to engage with world affairs. But it is equally clear that he has not been inclined to use his diplomatic power to promote political freedom. On his recent trip, Benedict could have advocated human rights, or protection for Cuban dissidents, many of whom are Catholic themselves. But on all these issues, he largely kept silent. Indeed, when it comes to papal visits and speeches, this pope has focused his diplomacy on ensuring the Catholic Church’s growth, even when it requires keeping silent about flagrant abuses of human rights. It didn’t have to be this way, as the example of Pope John Paul II attests. Benedict’s immediate predecessor set a very high bar as an international diplomat, undertaking 104 foreign trips, more than all previous popes combined. Indeed, upon ascending in 1979, John Paul II essentially redefined the papacy: Previously, popes had mostly dealt with the world in relative seclusion, from within the papal palace in the Vatican. John Paul, by contrast, traveled the world expressly to meet with world leaders and secular rulers, freely speaking his mind with them, and sometimes erring on the side of bluntness. He was also acutely aware that, in the era of modern media, his pastoral trips were being conducted within earshot of practically the entire world. So when John Paul II visited Chile, he made a point of irritating its dictator, Augusto Pinochet, by meeting with dissidents. When General Wojciech Jaruzelski suggested to the Polish bishops that the Catholic Church in Poland should replace the Solidarity union as the mediator between Poles and their government, John Paul II demonstratively ordered his bishops not to agree to any such arrangement. The current pope, Benedict XVI, decided from the start not to imitate John Paul II. His leadership of the Church has been informed by concerns that are simultaneously more pragmatic and more idealistic than those of his predecessor. In terms of pragmatism, Benedict XVI is chiefly interested in fortifying the institutions of the Church so that it can withstand a modern era that may be hostile to it; in terms of idealism, he truly believes that the rites, sacraments, and spiritual teachings of the Church are themselves capable of making the world a better place. Correspondingly, he feels less of an affinity for the social and political teachings of the Church. Thus, while in Cuba—one of the most repressive nations on earth—Pope Benedict spoke only obliquely of freedom and respect for human rights. He also met privately for a half-hour with the ailing Fidel Castro and several of his progeny, while claiming that his schedule was too tight for a one-minute meeting with the dissident Ladies in White. When a Cuban was savagely beaten by government thugs at the papal Mass in Santiago and hauled away, simply for shouting “down with communism,” Pope Benedict said nothing. When thirteen dissidents who had sought asylum in a Havana church were also assaulted and dragged away by police—at the express orders of Cardinal Jaime Ortega, the archbishop of Havana—Pope Benedict said nothing. He also said nothing about Cardinal Ortega’s willingness to turn the Catholic Church in Cuba into an arm of the state. But he did manage to scold the United States for its so-called embargo, and thereby please his hosts. 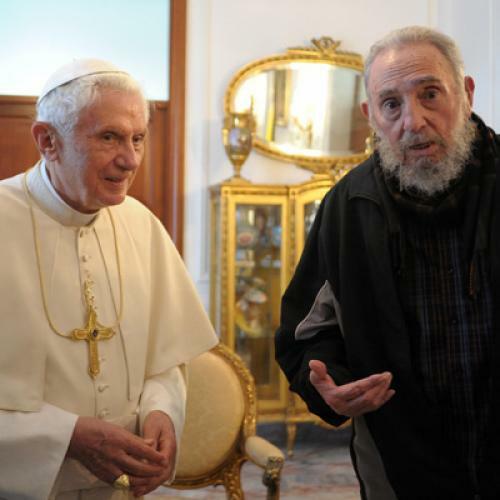 What Pope Benedict did and said in Cuba is representative of his approach to today’s world and all its nightmares. When Pope Benedict speaks, he is most interested in making sure that those who rule this world make a space for the Catholic Church, and that the Church accommodate itself to its local circumstances. If this means meeting with dictators and blessing them while not giving a minute to the brave dissidents who daily confront the tyrants, then so be it. And this is exactly what he did in Cuba, where the only concession he politely requested of Raúl Castro in exchange for his visit and his blessing—a glorious propaganda victory for the rulers of Castrolandia—was that Good Friday should be made an official holiday. This miniscule concession won from Fidel Castro’s younger brother speaks volumes about Joseph Ratzinger, the man, as well as about Benedict XVI, the pope. Current papal policy is driven by a mystical trust in the saving grace offered by the Catholic Church, which, as Pope Benedict sees it, is the only institution on earth that keeps the human race from absolute, irredeemable disaster. As he has made clear numerous times, he is convinced that the ultimate goal of every human being should be a spiritual one, and that true freedom and genuine dignity will necessarily flow from a spiritual awakening. This chief message of his, which drives his policies, is not only highly abstract, but often couched in an odd scholarly and mystical prose. Indeed, it’s only his convoluted, esoteric speech that keeps him from sounding like a top business executive who is solely interested in profits and the success of his firm. If one focuses on his actions rather than his words, it seems that all Pope Benedict cares about is the growth of the Church. As a Catholic, I need to deal with Pope Benedict differently than non-Catholics. If he says he is convinced that freedom and genuine respect for human rights will naturally stem from the spiritual benefits that the Church has to offer this suffering world, I need to believe that he is sincere, even as he befriends Caesar and publicly ignores those oppressed by him. But I don’t have to agree with his strategy. As he said to tens of thousands of oppressed Cubans last week in his Mass homily—with Raúl Castro and his military junta present up front—Christianity “opens the doors of the world to truth,” especially the truth that “apart from God we are alienated from ourselves and hurled into the void.” It was a beautiful sentiment and a pithy summation of the Christian message—but not exactly a transparent critique of a Marxist-Stalinist totalitarian state.